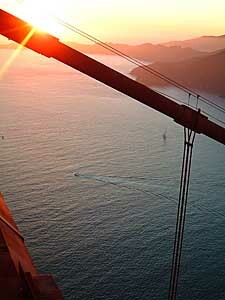 Lew comes into the office one day and says he and Krystal have been to the top of the Golden Gate Bridge. What?! It turns out that Krystal does photo framing work for Bob David, the official bridge photographer and staff architect, and he had taken them up. And it had been fantastic. I beg. Please, if there’s ever a chance . . . I love the bridge and would do anything to get up there. I meet Krystal and Bob at 6 PM. It’s a warm, balmy fall night. We check in at the headquarters, get hard hats, and then hop into one of the little Cushman bridge scooters and drive out to the south tower.There’s a brass plaque mounted there, with the names of the bridge builders, mayor, etc, dated in the ’30s. 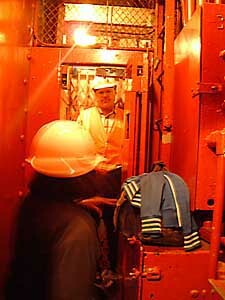 Bob opens a hatch-like door and we step inside the tower.The three of us jam into a tiny antique-looking elevator (the bridge was built in the mid’30s)  not a place for the claustrophobic  and start the ascent. I am excited out of my mind, it’s a dream come true. Evey time I drive across it, I admire the design. I love the fluting on the towers, the way it’s all designed to reflect light and create shadows, the color. Often when I come into the city, I cut through the Presidio and go down to Fort Baker, under the bridge, check the surf, and look up at the bridge. I’m a fan! The elevator has steel mesh sides, so you see the interior structure of the towers as you ascend. Finally we get to the end of the line, the lower surface of the top beam. Here we disembark and there’s a steel ladder with round and worn rungs about 20 feet long going up to the top, where there’s a hatch cover. Bob tells me to go first. I climb through the hatch cover, and step into the warm night, the sun getting ready to set, and I’m 700' above the water, it has to be one of the greatest thrills in my life. I’m surprised to feel perfectly safe; there’s a railing. I’m not crazy about heights, but this feels OK. It’s a unique vantage point. San Francisco: Baker Beach, the Presidio, downtown, the ocean on one side. Marin: Angel Island, the little yacht harbor, the brown hills on the other side. You can watch the cars going north and south, and see boats sailing or motoring and occasionally crossing under the bridge with white wakes. You look around at the construction, the heavy steel plates, the bolts, it’s amazing how good it looks after 65 years. ?Y-M-C-A . . . ? We go back down the elevator. In the parking lot Bob shows us the snack bar, which he designed. It’s a beautiful little building, in harmony with the bridge and the Round House, and the lettering is the same art deco style as on the brass plaque at the tower. I say to Bob, ?You’ve changed my life.? And it has, because now every time I see the bridge, from above (as you often do from an airplane leaving SFO), or driving across, or from below, or from the hills, I’ll always be remembering what it’s like on top. 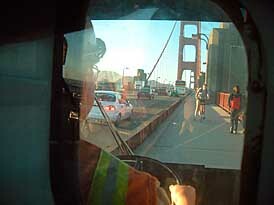 A few months later I took a kayak trip from Bolinas into SFO and went under the bridge. Note: if you’re at all interested in the bridge, see John VanderZee’s book, The Gate, which describes, among other things, how the real designer of the bridge was not Joseph Strauss, as is commonly attributed, but an artistic (an unheralded) engineer named Charles Ellis.